Private swimming pool and a outdoor shower .The patio area has 8 sun loungers and parasols.The villa has full satellite TV with English channels, flat screen TV.Full Internet access. There is a working barbecue situated at the side of the villa and a terrace with dining table to take full advantage of dining outside. A balcony from all bedrooms is the ideal spot for watching the wonderful sunsets whilst enjoying a glass of wine. The villa's walled and securely gated, landscaped garden with patio areas on both sides of the villa with wonderful views of the stunning 6000ft. Babadag Mountain and the sea in the distance. There is also a secure driveway and parking area. Sensor light over the entrance porch and lights along the driveway and garden walls. This Villa sits in a spacious 670 metre plot overlooking the valley below. Me and Tracy both live in Hull, with Tracy working with the NHS and myself being a Network Engineer working anywhere in the North. Visited Turkey three years ago and loved the area hope people who stay at the Villa enjoy the views as much as we did and do. Great place to relax and unwind and a enjoy a nice meal or BQ and few cool drinks with friends and family. Had some good reviews from people who have stayed at the Villa over the last couple of years please check out what they are saying about staying at the Villa. The property is just ten minutes from the fabulous blue lagoon beach. If you are looking for great food in the comfort of the apartment, we can also recommend local caterers who can provide delicious evening meals at reasonable prices. Would like to think staying at the Villa and seeing the wonderful views will make your visit very enjoyable for you and your family. Ground floor comprises open plan kitchen/dining and lounge area with comfortable sofas and arm chairs. There is also a TV and DVD player. Large French doors lead out to the 70 sq.m. terrace with seating areas on both sides to admire stunning views. Large open plan, modern fitted kitchen with marble flooring. electric oven, fridge, microwave, toaster, kettle, washing machine, dishwasher, iron and ironing board. All kitchen crockery & utensils supplied. Notes on accommodation: Air-conditioning is installed in all rooms. This is non-smoking villa. The Villa has wireless internet access. Full alarm system is in place. Use of local tennis courts with great rates and only 50 meter walk away. To view the Villa on the map zoom into 61 SK and its the Villa at the top of the complex on the right as you look at the map which show two villas. Outside: The pool has a shallow end approx 1.4m with sloping steps where the pool then graduates down to a depth of 2.4m. Most swimmimg pools in Turkey don't have a stepped access this makes its more child friendly. The gardens to the villa are private and quiet and landscaped to a very high standard with cacti and palm trees. There are lemon and pomegranate trees with flowering shrubs to the side of the villa. The 2 terrace areas are 40sqms and marbled, there are 8 sun loungers and 4 parasols with small outdoor tables to place your drinks whilst you soak up the rays. A large table with chairs is situated on the patio with a canopy to provide shade whilst eating. A stone built bbq is located in the garden and fully equipped to make the most of the Al Fresco dining experience. The private stepped pool enjoys the sun all of the day through to early evening. Cleaning / Towels / Linen / Maid service: All bathroom towels are provided, as is bed linen and kitchen linen. Weekly cleaning can be arranged at an extra cost. Ideal villa for a peaceful and relaxing vacation. Our family stayed for 10 nights. Villa was ideally located for us being a little off the main roads and thus very peaceful. Villa, villa facilities and pool area are to a very high standard. Great views. We've absolutely loved our stay at Villa Verde. It is a beautiful place in a fabulous location and I'd definitely recommend if you chose ovacik then stay in Lenny's villa. The location is ideal and within walking distance to pubs/restaurants. It's maintained to a high standard and having Andy & Sharon next door to help you makes all the difference. Nothing is too much trouble and if you need assistance they're there immediately. We've thoroughly enjoyed our stay in this beautiful villa and we will, without doubt, be returning to this place. We can't recommend this highly enough. Thank you for making our holiday the best yet! Thanks for the review and that you enjoyed you hoilday and the Villa, here myself at the moment loving the weather and people. Again many thanks for the comments and hopefully hear from you again. Just returned after 2 fantastic weeks, the Villa is immaculate it far exceeded all our expectations. We were greeted on arrival by Andy and Sharon who manage and care for the Villa to a very high standard, they are a lovely couple who cannot do enough for you to ensure you have a wonderful stay, we became good friends and enjoyed a few nights out in the local restaurants with them. There a three lovely family run restaurants within walking distance down the road providing excellent food at reasonable prices. 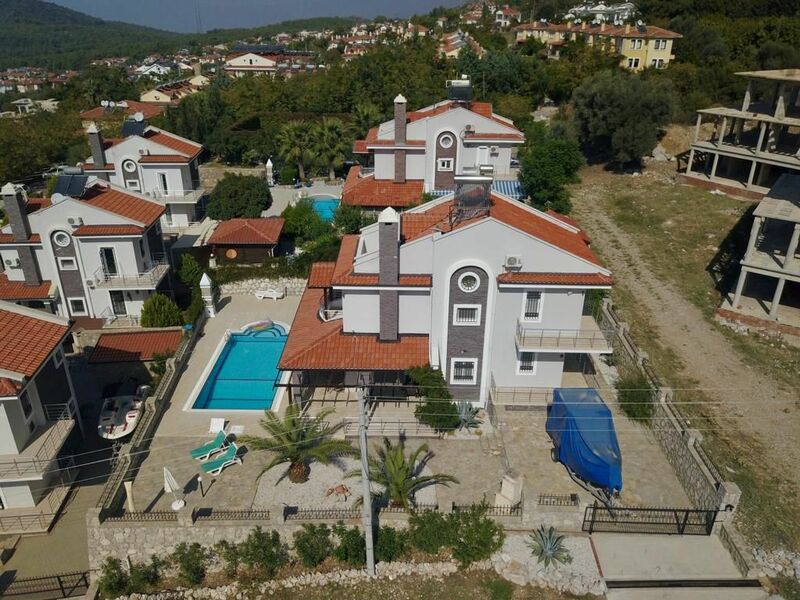 The Villa is situated just below the forest area of Ovacik providing fantastic views of the mountains and the valley leading to the famous Olu Deniz beach area and the nightlife of Hisonaru, which is just a short Taxi or Dolmus (Mini Bus) drive away. We did walk into Hisonaru on a couple of occasions which took about 30 Minutes, but approaching retirement age we opted for a Taxi ride back. We would and have already highly recommended this property to our friends and relatives. A big thank you to Andy and Sharon and there good friend Vera for making our holiday so special. This Villa is a credit to Lenny & Tracey hope to return next year. Paul & Nwyla Tatton. Villa Verde is lovely! A beautiful pool and landscaped gardens. We had everything we could have needed. Every bedroom is en suite, which was great for 8 of us! The surroundings are peaceful and yet only a short walk to local bars and restaurants. Stunning views of the mountains and woodland walks behind. The owner in the UK was great to chat to, so helpful! And the neighbour Andy was always on hand to recommend services. He organised our car hire from Hamish McTurk! We later booked several excursions through this company. Fantastic personal service! We could also order all our provisions in advance and Andy had everything waiting for us on our arrival! This was a stunning holiday for the whole family!! This is the third time we have stayed at Villa Verde, so that say's a lot about the property. It is a villa that has the lot, every time we go back, Lenny the owner has made improvment for the comfort of it's residents, the latest edition being the Wi-Fi and English TV to keep up with what's happening back home. Andy the Cartaker is the man, knows everything, knows everyone and is on the scene when you need anything, what more can you ask for.There is a lovely sized pool to keep everybody happy, especially our kids, they would stay in there all day and night if they could. The Villa is clean and spotless and well maintained by Andy. Location wise the Vila has everything, there are restaurants and supermarkets close by. A brand new Waterpark is also not far away and a visit is a must, for those home birds, Friar Tucks will serve you a great sunday roast and believe me I have had a few in Turkey and this is the one. Throw in a Jeep Safari and a boat trip and you have had the perfect holiday. Thanks for that great review and over the moon that you enjoyed your stay again. And yes Andy is the man and above all loves his role in helping all the customers and his knowledge of the area is first class. Just returned from the Villa , We booked it very early in the season as a last minute get away . The town was just opening up and getting ready for the season .But from start to finish it was a perfect break , Andy the caretaker / manager arranges for you to be picked up at the airport .He puts a fridge pack in for you just so that when you arrive there will be a drink of beer wine juice and some thing to eat [Extra of Course]. The villa will sleep 8 adults comfortably it is set in a beautiful location the views are magnificent. Andy can and will arrange a taxi for you or Lenny will leave a mobile for you to use to order food or a taxi .The restaurant at the bottom of the hill Sea Shell does a really good Sunday Roast for 18 Lira and also on a Friday night he does a Fish and Chips for 15 Lira , he will even come to the villa and pick you up , then drop you off after . The local bus will take you to either Fetiyha or the Blue lagoon for a couple of Lira .For me the villa was ideally situated .Close enough to the towns but then when you want to get away from the hustle and bustle you have a private swimming pool to relax in and cool down. Would I go again YES .We are already trying to sort two weeks in June if I can get the time off work . The villa is under the well known Babadag mountain range, which peak at 6000ft, so the area is popular with hand gliding and micro lights. For the really crazy people out there you can jump off the mountains with a trained handgliding expert and land around an hour later on the beach at Oludinez. At the beach there are the usual water sports, and gulet/cruise boat hire. The ghost town of Kayakoy is 15 mins away by car or dolmus for those of you that like a bit of history. There is a lesser known beach at Gemilier that is extremely pretty, about 25mins away again by car or dolmus. Fethiye is close by and the weekly market is well worth a vist as is the lovely harbour and fish market where you can buy fresh fish and have it cooked at a nearby restuarant. For those that fancy changing their appearance, or a nip and a tuck, there is a well qualified and eminent practice based in Fethiye. Apparently the prices in Turkey are very competitive in this field, and the procedures excellent. The main beach at Olu Deniz is large and very beautiful and is only 10 mins away via car or dolmus. The famous Blue Lagoon is also close by about 15-20 mins by car or dolmus. The lagoon is a protected area due to its wildlife, marine life and stunning natural beauty, there are lovely beach areas at the lagoon to top up your tan or just rest and admire the views. The dolmus service runs every five minutes and will take you directly to the beach, lagoon or out to Fethiye. Dalaman airport is approx 60km from Ovacik and transfers can be arranged at a reasonable cost. For guests wishing to explore Turkey, car hire is recommended but not essential as there are lots of good local tour companies who are ready to assist and the local dolmus service is excellent. The lively resort of Hisaronu is 10 mins away by car or dolmus but is also a nice walk, taking approximately 20 mins to reach the centre. The walk will take you past lots of bars and restaurants as you stroll through the village of Ovacik into Hisaronu. Fethiye, the main town is 20 mins away and boasts the real turkish atmosphere. For history, the village of Kaya Koy (ghost village) is 20 mins away by car or dolmus, well worth a visit. Supermarkets are open from very early until late in the evening every day of the week. The best shopping area for clothes and gifts is found in the bustling town of Fethiye and the large out door market takes place every Tuesday. Here you can buy everything and anything, the market is truly incedible and well worth a visit. In Hisaronu a smaller market is held on a Monday where you can buy fresh fruit and vegetables along with clothing and holiday souvenirs. There are many activities to be found in Olu Deniz, you can enjoy boat trips, paragliding, diving, pedaloes, rafting, microlight flights. For those who dont want to move far from the villa there are an abundance of shops selling everything you would need. The main road is lined with restaurants and bars including Turkish, British, Italian, Chinese, Indian and once you reach Hisanoru there are plenty more restaurants to choose from along with bars and clubs. There are plenty of exchanges open during the season for currency excahange with competative rates.You are better changing only a minimal amount of money in England, as the rate is always a lot better in Turkey, although not at the airport! the villa is approximately a 20 minute down hill walk to Hisaronu where you will find an abundance of shops bars and restaurants. A taxi to Hisaronu will cost around 10-14TL and 20TL to the beautiful beach at Oludeniz. There is a local market selling fruit/vegetables clothing handbags and watches every Monday and the same market but much bigger in Fethiye on Tuesdays. Booking Notes: To book telephone or email (See below), owners (Lenny and Tracy). An 25% deposit taken at time of booking, balance to be paid 6 weeks before departure. Deposits are non-returnable. A information pack will be provided and we can arrange a hire car and pick up from the airport if you wish, just let us know when you pay the balance of your holiday, i.e. 6 weeks before departure. Changeover Day: Changeover days are flexible. Transfers can be arranged, please ask for details. We do ask for departure from the villa on the day you are leaving to be by 12 noon, so the cleaning team can do their stuff, but if no one is booked that day we are flexible. Notes on prices: A 25% deposit is required on booking with the outstanding balance to be paid in full 6 weeks before your departure. If the villa is booked with less than 6 weeks before your departure then the balance is due in full upon booking. We also require a refundable cheque of £200 to cover breakages. Obviously if it is only a glass or cup just replace it yourselves. We will return the cheque when we have confirmation that the villa is fine (the cleaning staff will let us know the day you leave).